Zahi Theme The Zahi restaurant website theme will give you the opportunity to show your restaurant as a professional enterprise that prepares great food. Build your brand on the internet and run online ordering. Great restaurant website theme Use the Zahi restaurant website template and build your restaurant website. It will help you to generate more food deliveries and takeouts thanks to the integration with an online food ordering system. Restaurant website themes from the UpMenu system give you the ability to easily edit content with a simple CMS that supports your activities. You save time and money. Show your perfect dishes The Zahi restaurant website template will help you show your great food. Present the best photos of your dishes on the main page so your customers can see how good they are. Make them hungry. UpMenu themes are designed to generate profits online. Simple navigation to online ordering will increase the conversion to your restaurant website. 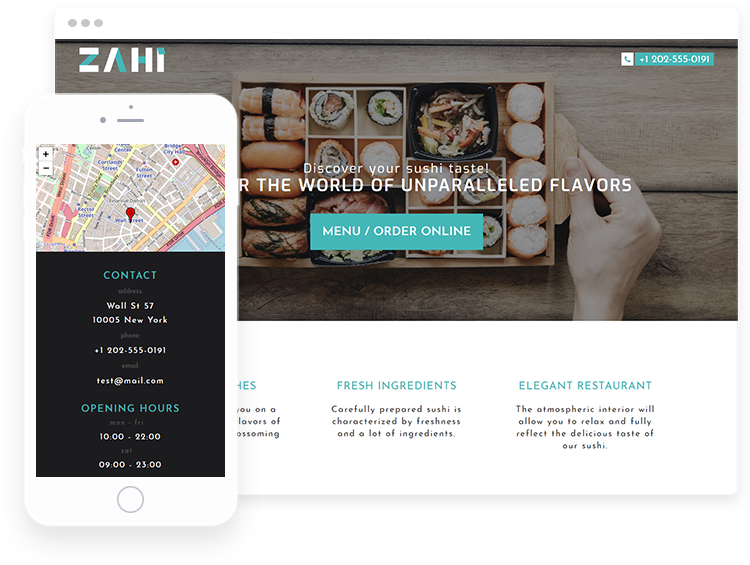 Build your brand on the internet Thanks to the Zahi restaurant website template you can start building your restaurant's brand online. Show that you are a professional restaurateur and do not limit yourself to promoting online orders from food ordering portals. Start earning food delivery on your own terms. Take advantage of the potential that is hidden in the restaurant website themes and showcase your professional image to clients. Let customers order online Do you know that over 85% of customers look for a restaurant on the internet? Build your website using the UpMenu templates for restaurants and run an online food ordering system for free for 30 days. The Theme menu will be completely adapted to the restaurant website and will allow your customers to place orders online, including on mobile devices. Generate more food delivery and earn more. Please be advised that the following entity is the administrator and controller of your personal data: Tastysoft Sp. z o.o., located in Łódź at ul. Sienkiewicza 85/87 (floor XI, room 8), 90-057 Łódź, National Court Register No. : 0000411725, e-mail address: kontakt@upmenu.com: a) Your details shall be processed in response to your request and addressed to the Administrator. You need not provide them, but if you fail to do so, it shall make contacting you impossible. b) Your details shall be made available to persons (employees) authorised by the Administrator only for the purpose of fulfilling your request for contact. c) Your details shall be stored until communication, initiated by filling-in this form, is completed. d) You shall have the right to access your personal details, rectify, delete, limit their processing and/or transfer them to another administrator. e) You shall have the right to lodge a complaint with the Supervisory Authority which controls the legality and accuracy of the processing of personal data. f) Your details shall not be transferred outside the EU or to any international organisation. g) Your details shall not be subject to profiling or automated decision making. Hello. My name is Marta. Join me to see the demo. I will show you how to use UpMenu and online sales to increase the profits of your restaurant. We have more than 10,000 subscribers. Become one of them.